Testing coffee makers is fun. But I am writing this with my shaky hands and with one of my eyes pulsing. I guess there is such thing as “too much coffee”. Who would’ve thought! You see, I am ready for sacrifices when it comes to picking only the best products for you. And today, I’ve prepared 7 best coffee makers, each of which can make you that flavorful, perfect cup of your favorite hot beverage. What makes this machine special is the value for money it offers. While the recommended retail price is $150, this model is sold at only $110. Additionally, it has a simple design and shows excellent performance. For such a price, you get a whole lot of cool features and a perfect cup of coffee every time. Now, this particular model has a stainless steel carafe, which can hold up to 8 cups of coffee, keeping your beverage warm and flavorful. There is an optional pre-infusion feature that makes the flavor even richer. The machine signals when the coffee is ready. Additionally, it comes with a 2-year warranty, which is a nice bonus. This top-rated coffee maker is a perfect option for people who want the best value for money. It packs many cool features and makes a good cup of coffee (8 cups, to be exact). So, if you want something that brews flavorful beverages and if you don’t need your coffee to be boiling hot, this brewer is definitely for you. This model truly deserves to be among the best coffee makers thanks to its efficient operation and the coffee quality it offers. This is the coolest drip coffee maker that dispenses one cup at a time and allows you to enjoy only fresh beverages. No need to deal with leaky or fast-cooling carafes! 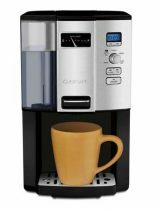 This budget-friendly programmable coffee brewer by Cuisinart holds the top place in numerous coffee maker reviews. It can be programmed beforehand (up to 24 hours in advance) and features an auto-off function to save energy. If you have enough counter space and want your coffee one cup at a time without the hustle of reloading the machine, this model would be perfect for you. It’s also suitable for people who need to save a buck or two but still want a nice, quality product. 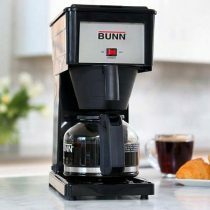 If you want the fastest and the best coffee maker, you should definitely consider this model by BUNN. While other machines take no less than 5-6 minutes to brew coffee, this one fills a pot in about 3 minutes! Some coffee maker reviews note that this model isn’t the most aesthetically pleasing. However, it was built to last, and that’s what matters the most. The machine uses a stainless steel hot water reservoir that keeps the water at the optimal temperature for brewing. There’s also a special multi-stream spray head, which ensures that the water covers the ground coffee evenly for maximum flavor. This machine is perfect for users who want something simple (without those fancy extras) but capable of brewing a decent quantity of good coffee in almost no time. Feel like this coffee maker will be perfect for you? To brew the perfect cup of coffee, you need to know the right water/coffee ratio. Experts recommend using the 1/20 ratio (1 part coffee and 20 parts water). However, some people prefer a stronger brew and use 1 part coffee and 14 parts water, for example. It all comes down to your personal preference. What makes this machine stand out from other coffee brewers is its versatility. It can work equally well for one person and for a big family thanks to its two-way brewing system. “Conveniently, this coffee maker has two separate water reservoirs (one for the pot and another one for the single cup). 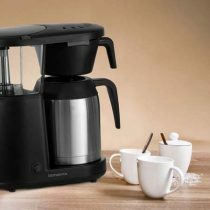 This allows for accurate and fast brewing without even a drop of water being wasted.” With two different ways to brew coffee and different strength adjustments, this machine by Hamilton Beach allows for a very flexible use and gives you more control. You can even use soft coffee pods if you’re feeling a bit lazy. Additionally, this model is programmable and lets users set the timer up to 24 hours in advance. This coffee brewer is ideal for people who need one machine for different occasions. It makes beverages for one and for a company of people, which means it offers a rather flexible use. What makes this coffee brewer so special is how adjustable it is. You can choose the strength of your beverage and set the hot plate temperature to the most optimal degree (or according to your personal preference). This gives you the freedom to get your desired perfect cup of coffee. The Cuisinart coffee maker brews coffee at 200 F temperature. It features a showerhead system, which results in great tasting coffee. You can choose the strength of your beverage between regular and bold. Additionally, you can also set the temperature of the hot plate according to your personal preference. And, as a nice bonus, you can enjoy the coffee batches as small as 1-4 cups. If you don’t mind some small issues with the carafe and want a good mid-level coffee maker, this model would be perfect for you. It has all the essential features, reliable design, and simple operation. To be honest, I feel like this coffee maker has the potential to become your most favorite object in the whole house. This is a truly luxurious model that makes incredibly delicious coffee, offers efficient and effective operation, and looks amazing. Hands down, it’s worth every penny. The KBG has an independently heated hot plate, which keeps coffee at a stable temperature (between 175 and 185 F). It can brew a whole carafe or only a half of it, whichever you prefer. This model is recommended by the Specialty Coffee Association of America. Impressive, right? The Moccamaster KBG coffee brewer is ideal for people who want a good, reliable machine that can brew an excellent cup of coffee (and, obviously, for those who don’t mind investing more in a coffee brewer). Want to see this coffee maker sitting on your kitchen counter? Being the most popular pod coffee maker, the Keurig K-Classic has a lot to offer. It is fast, super easy to use, and makes good-tasting beverages. This is probably the most user-friendly coffee brewer, which is ideal for when you need a single serving of your favorite beverage. With a simple button-controlled operation, the K-Classic makes hot beverages in no time. It has a large water reservoir, so you don’t have to fill it up too often. Additionally, it brews different cup sizes. The drip tray is removable, so you can brew coffee into larger cups (a travel mug, for example). If you love iced coffee but don’t want it to taste too watery once the ice starts melting, you can implement one simple trick. Freeze the brewed coffee and then use the coffee ice cubes to make your iced beverage. When the ice starts melting, your coffee will remain just as strong and will not lose its flavor. This machine is perfect for people who want their coffee fast and without much effort. It’s a great single-serving brewer that doesn’t require much from you but still makes a good cup of coffee. 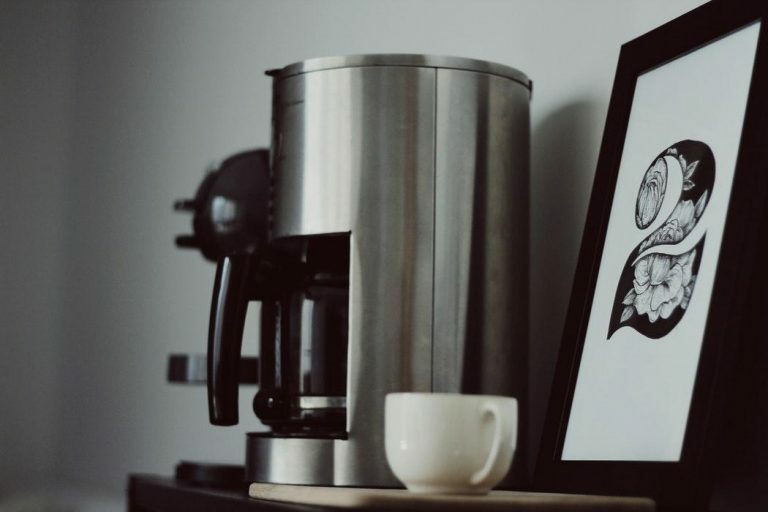 To buy a new coffee machine, all you have to do is figure out your coffee drinking habits. And then you just need to match them with a suitable maker. Easy, isn’t it? What coffee do you like? Is it espresso, cappuccino, latte, or something more uncommon? Whatever type you prefer, make sure that the machine you’re considering is able to make it. How much do you need? If one cup isn’t enough for you to start your day, you should go with a larger model that can brew around 10 or 12 cups at a time. If you want a freshly brewed coffee to wait for you right after you wake up, get yourself a machine with a programmable timer. It will turn on automatically and prepare a hot beverage while you get out of bed. Just remember to add some water and freshly ground coffee the night before. How much space do you have? You might want a large luxurious coffee maker, but if your kitchen is really small, chances are you won’t be able to fit it in there. Even if you will, it’s likely to look too bulky and feel out of place. How often do you drink coffee? If you need it regularly throughout the day, it is better to get a machine with a carafe or an insulated mug. This way, you won’t have to brew coffee every time you want a hot beverage. 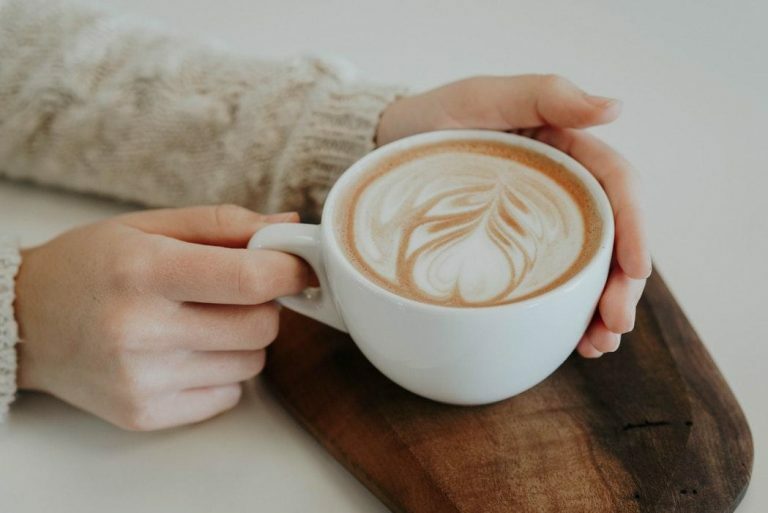 Investing in a coffee maker is actually a good way to save some money, especially if you drink coffee regularly and frequently. Don’t worry, the barista from your favorite coffee shop will not feel offended if you stop coming. Drip coffee makers. These machines involve pouring hot water over the ground coffee, which is placed in a filter. Espresso makers. In this case, a machine forces hot (boiling, to be exact) water through the ground coffee (which has to be very finely ground) and directly into a cup. These makers can be automatic and semi-automatic. Smart coffee makers. These involve using an app that controls the coffee maker’s operation. Thermal (carafe) coffee machines. These machines feature an insulated carafe, in which the coffee is “stored” and kept hot and fresh (instead of being poured directly into a cup). French press. Also known as Coffee Press or Press Pot, this type offers the simplest way to make a good cup of coffee. What you need to do is place some ground coffee in it and pour hot water over it. Then stir it and leave to brew for a few minutes. Press the filter down to keep the ground coffee at the bottom and pour yourself a cup of this hot beverage. Moka (stovetop) pot. Its construction is rather simple. There’s a water chamber at the bottom. The coffee goes into the middle section. When the water starts boiling, it travels through the chamber and goes over the coffee. And voila, your espresso is done! No matter how smart your coffee maker is, it cannot clean itself. Thankfully, this process isn’t that complex, so you’ll probably manage to deal with it in almost no time. Fill the water chamber with a mixture of clean water and white vinegar (1:1). Put a paper filter into the basket and brew half of the water. Then leave the rest of the mixture to soak. After an hour or so, brew the rest of the water. This will clean the insides of the machine. Change the paper filter and put another cycle on, but this time use only the clean water. This will rinse the vinegar out of the system. Wipe inside the chamber using a damp cloth. If you notice any larger debris or loose grounds, gently scrub them with a sponge. You can clean the carafe (if your machine has one) using some warm water and dish soap. If the carafe has some dirt or spots on the outside, use a damp cloth. Try to avoid using anything abrasive since it can damage the exterior. If the water reservoir has calcium deposits, you need to use a special coffee maker cleaning product. It might cost a bit more, but it will keep your machine operating properly. You might consider yourself a coffee expert. Or, you may be a coffee enthusiast who just wants to bring his or her coffee making skills to a whole new level. Whatever the case is, I bet these simple tips and tricks can change your life for the better. Buy only fresh coffee (whole bean, of course). Pre-ground coffee is definitely a simpler (lazier, I should say) solution. However, it just doesn’t taste that good, no matter how cool your coffee machine is. Fresh coffee beans are of higher quality. Yes, you will have to grind them yourself, but your coffee will taste so much better. You just need to learn how to pick freshly roasted beans, and each of your beverages will taste amazing. A quick tip: you can always find some freshly roasted beans at local coffee shops. Some of them even roast the beans right there on the spot, which means you will get the freshest roast possible. Store your coffee properly. A vacuum-sealed container is a perfect option, but if you need a simpler solution, a good old Mason jar will do the trick. Some people store their coffee in the fridge, but I personally believe that it’s better to buy smaller batches and store them sealed in a jar in a dark and dry place. Whatever you decide, just don’t leave your coffee beans in a bag or in an open jar. Know when to grind your coffee beans. To get the most flavorful, fresh taste, grind the beans right before brewing. Experts note that coffee tends to lose its flavor within half an hour after being ground. Check the temperature. Many coffee makers fail to reach the proper water temperature for brewing. So, it’s better to set the temperature yourself if your machine allows for it (it should be 195-205 F). Use clean water. Many users forget about this aspect (or believe that boiling the water makes it good). But the thing is, hard or unfiltered water compromises the taste of your coffee. At the same time, heavily filtered water can be just as destructive. What you need is distilled or lightly filtered water, which you can buy at pretty much any supermarket. I know that some people cannot live without coffee. Seriously, without their regular caffeine fix, they look like the most miserable people on Earth. If you are one of them (or even if you’re a beginner coffee enthusiast), I’ve got good news for you. There are 7 awesome coffee makers, each of which can guarantee a rich flavor and a good taste. However, there is one particular model, which I would not hesitate to buy for myself. I am talking about the Hamilton Beach Programmable Coffee Brewer (model 49980A). This machine combines everything you would want: quality build, flexibility in use, and excellent performance. It is suitable for a solo user and larger parties of people. And it offers great value for money. What else is there to wish for? Have you already picked your favorite? And how much of a coffee addict are you? Let us know in the comments below!